I’d like to take a moment & belatedly congratulate all of the Maryland lifters that competed at USA Powerlifting Raw Nationals last week. 90+ state records were set or broken, and I’ve just approved them all in the database. Also, I would be remiss if I didn’t take a moment & extend a HUGE thank you to my referees that volunteered their time and worked as Technical Controllers: Melissa Copeland, Ali Squiller, Brad Couillard, Heather Hoff & Allie Feras. At one point in the competition, a Maryland or DC referee was working 4 of the 5 platforms as Technical Control, and 6 of the 20 State Referees that volunteered for the meet were from MD or DC. I hope that all of us that volunteered our time will consider climbing the ladder & becoming National Referees when the time is right. Speaking of which, I have been contacted by numerous individuals in the week after the meet about becoming a State Referee for USA Powerlifting. If you’re interested, contact me & we can discuss the process. 2016 Athens Winter Showdown announced! Our first meet of 2016 will be the Athens Winter Showdown at Athens Health Club in Sykesville, MD. ***SUBJECT TO CHANGE; Dependent on number of lifters, etc. All lifters must be registered USA Powerlifting lifters. Memberships will NOT be available the day of the meet. See link on REGISTRATION page to purchase a membership with USA Powerlifting. Athletic shoes must be worn. No boots or Vibram Five Fingers allowed. Whether this was your fist Powerlifting competition, or if you are a Powerlifting veteran – You performed phenomenally, and we look forward to seeing you again in 2016! I would also like to extend a heart felt thank you to all of the Referees, Spotter / Loaders, Software Technicians, and Table volunteers that make these events run so smoothly. Meet Results are available for the USA Powerlifting Baltimore Powerlifting Open held on July 11, 2015. 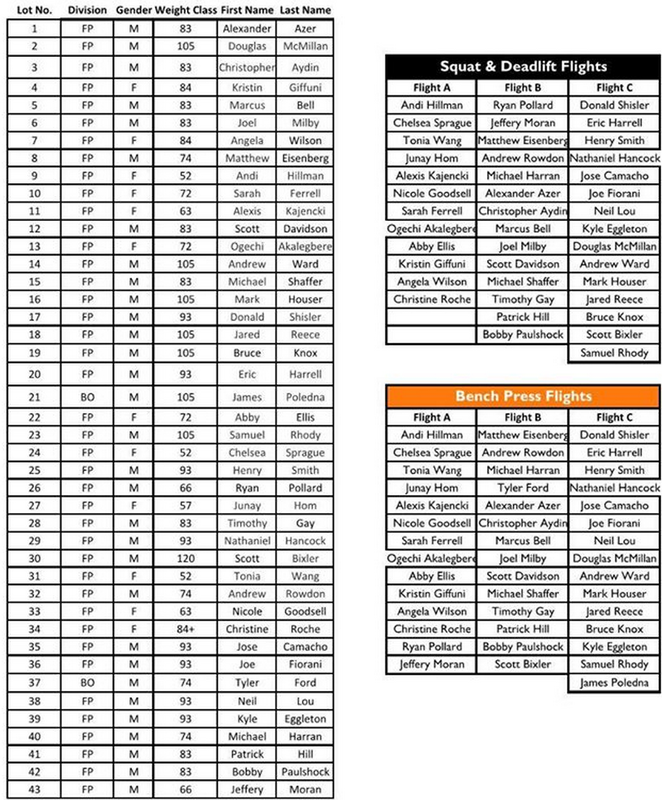 Meet results are now available to the 2015 USA Powerlifting Equinox Open held at Top Tier on April 11th and 12th. Meet results will be reviewed for any state records that may have been broken. This is a manual review process that takes a little time. REGISTRATION: Registration is closed for this contest. REGISTRATION WILL OPEN ON SUNDAY, APRIL 5TH AND WILL CLOSE WHEN WE REACH 50 LIFTERS. IF YOU REGISTER TOO LATE, YOU CAN BE ADDED TO OUR WAITING LIST BY EMAILING THE MEET DIRECTOR YOUR FULL NAME, ADDRESS, AND PHONE NUMBER. ELIGIBILITY: ANY MALE OR FEMALE AGE 14 YEARS OR OLDER. USA POWERLIFTING MEMBERSHIP: ALL LIFERS MUST HAVE A VALID USA POWERLIFTING MEMBERSHIP CARD, WHICH CAN BE UPDATED AND PURCHASED AT THE MEET. USA POWERLIFTING/IPF RULES WILL BE ENFORCED. 10% OF THE LIFTERS WILL BE DRUG TESTED. NON-SUPPORTIVE T-SHIRT AND SHOES MUST BE WORN IN EACH EVENT. NO KNEE WRAPS. Raw lifters may only use the single ply knee sleeve during their lift, and it may not have any Velcro on it, must be both non-adjustable and non-fastening. LIFTERS ENTERING THE DEADLIFT MUST WEAR SHIN HIGH SOCKS COVERING UP TO THE BOTTOM OF THE KNEE. BELT AND WRIST WRAPS ARE ALLOWED. ABSOLUTELY NO REFUNDS FOR ANY REASON. MEET SHIRTS: SHIRTS ARE INCLUDED IN YOUR ENTRY. ADDITIONAL SHIRTS ARE AVAILABLE FOR $10. AT THE MEET, T-SHIRTS WILL BE AVAILABLE FOR $15. AWARDS: TOP 3; BEST FULL-LIFT FEMALE; BEST FULL-LIFT MALE; & BEST FULL-LIFT MASTER 50 & OVER. SCHEDULE: Friday, JULY 10th: CHECK-IN – RACK HEIGHTS / RELEASE / OPENING ATTEMPTS. This is optional and can be done on Saturday. Saturday, JULY 11th: OFFICIAL WEIGH-IN BEGINS at 7:00 to 8:30 a.m. WHILE COMPETING ONLY IN THE OPEN, AGE GROUP STATE RECORDS CAN STILL BE ESTABLISHED. 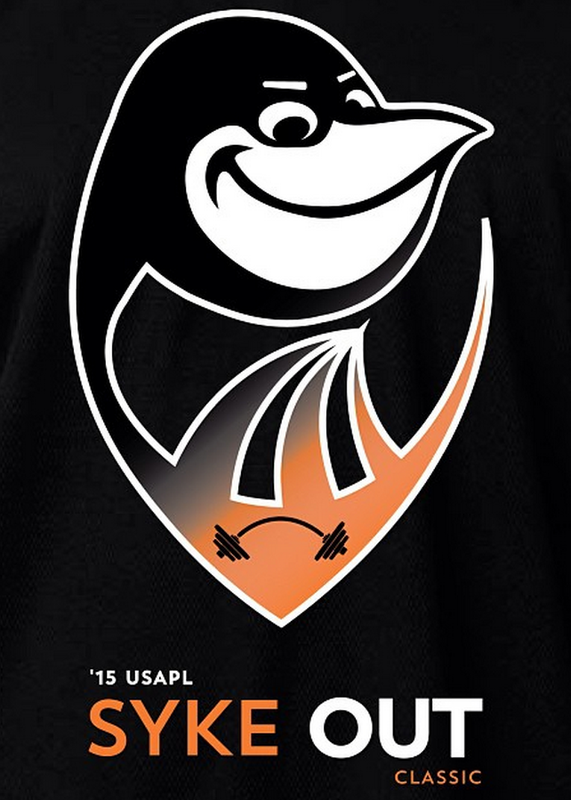 ROSTER & FLIGHTS WILL BE POSTED TO THE USA POWERLIFTING MARYLAND WEBSITE. Every human should be able to do one pull-up. If you can’t, you’re either too fat, weak, or both. Pull-up ability is largely a function of strength to bodyweight ratio. This explains why some men can deadlift 700+ pounds while some women are well into the 400s and beyond, but neither is able perform a single pull-up. While deadlifting may be the truest test of total body strength with a barbell, pull-ups demand greater balance and coordination than bending over and picking something up. Therefore, devoting some of your training time to pull-ups can pay dividends in a variety of athletic endeavors. Pull-ups have less to do with one’s total body mass and more to do with your body composition. A prime example is current USA Powerlifting American Record holder in the squat, Ray Williams. Ray weighs about 170kg (374-pounds). In addition to routinely squatting 900+ pounds, Ray can do 10 pull-ups. Here’s a young woman executing 19 flawless pull-ups. Lastly, here’s former gymnast and current 52kg USA Powerlifting American Record holder Marisa Inda demonstrating prodigious strength with her unique twist on pull-ups using a Smith Machine. In my 2008 article, I argued that the pull-up was the squat for the upper body. My stance hasn’t softened. The pull-up has been, is, and always will be one of the best exercises for upper body development and strength. They specifically target the middle to upper back and the since the back is a focal point in all three powerlifts, the pull-up is a vital exercise for any strength athlete. Pull-ups are one of SSPT’s big five movements including the squat, deadlift, bench press, and overhead press. As long as the trainee exhibits no significant physical constraints of the elbow, shoulder, or wrist, every strength training program should include pull-ups. In addition to building a stronger, thicker back, pull-ups really build the bench press because the actions of scapular depression and retraction are similar to setting-up for a heavy bench. Consequently, they remain a staple in all of our lifters’ training plans. This article is aimed at trainees capable of performing at least two strict bodyweight pull-ups. Strict pull-ups are defined as starting from an elbows-extended, straight-arm, dead-hang position followed by pulling the body upward until the chin is above the bar from which you are pulling. After reaching the top position, lower the body to the start position. Step 1: Test your max reps via one set to positive muscle failure. Positive muscle failure occurs when you can no longer pull your chin above the bar. You should be fresh so choose a day when you can test first in your training session. Begin with one set at about half your bodyweight. For those with access to an assisted chin/dip machine, set the weight at 50% of your bodyweight and perform one set of approximately five to eight reps. If you don’t have access to an assisted machine, then use a heavy band. The idea is to warm-up first, ignite your nervous system, and prime your muscles for the all-out effort. Rest a minimum of three minutes. Now test with the grip you plan on using during most of your training. We mostly prefer the gold standard, double-overhand grip but if you have shoulder issues or mobility limitations, then implement another grip. Do not perform any additional pull-ups on test day. Step 2: Record the number of full reps you achieved. Divide that number in half and that’s the number of reps/set you’ll be doing at the start of your plan. Essentially, your sets will be done with 50% of your max. If your max is an odd number of reps like 3, 5, 7, 9, or 11 then your starting point is 1, 2, 3, 4, or 5 reps respectively. Always round down. Never round up, as it will blunt progress. When? Pull-ups will be performed once per week. 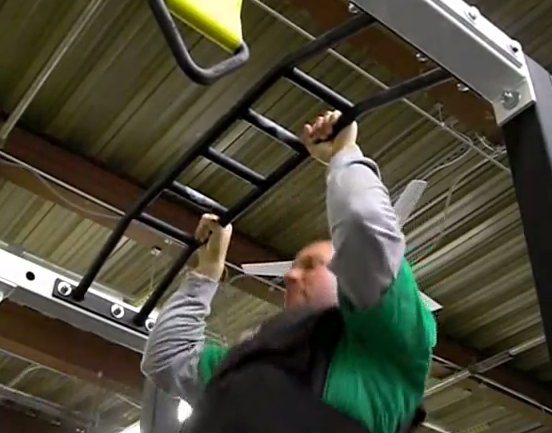 While rows are the antagonist action to horizontal pushes like the bench press, the pull-up is the opposite move of a vertical push like overhead presses. Pull-ups pair well with overhead presses and/or a second bench press day. If that doesn’t mesh with your current training template then simply fit them in on a day when they won’t inhibit another big lift. In other words, pull-ups should always be performed after your sport-form work. You rest a while and tackle your second set. You rest a while and tackle your third set. Taking each set to failure adversely affects the following set. With nine reps, you enter the second week hoping to get more than nine. You might end up with 10 and even 11 the following week but you’ll soon regress and cease to make progress. In the same manner we build training volume for the powerlifts, the SSPT Pull-up Program accumulates volume through the number of sets performed rather than the number of reps per set. In this case, you’ll always begin with 50% of your max (or slightly less if your max reps is an odd number). This ensures that you won’t train to failure, which increases the number of approaches (sets) and also the probability of enhanced technique via a more positive motor pattern. 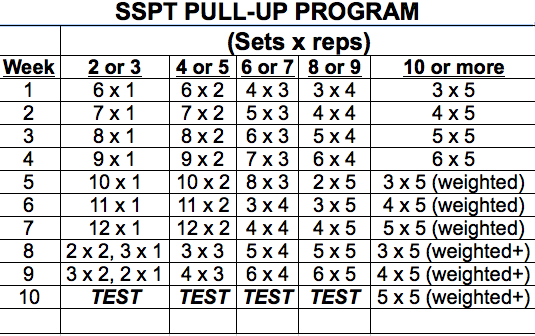 At SSPT, our volume goal (for most trainees) is roughly 20-25 weighted pull-up reps/week. Regardless of your current ability, you’ll notice each week starts at roughly half the volume goal or 10-12 total reps. Looking at the spreadsheet below, find your max reps and follow the weekly plan in a sets x reps fashion. As you’re starting with 50% of your max reps, the sets should be reasonably easy. Resist the temptation to start at a different week or do more reps. This is not some quick fix routine claiming to have you at 20 reps next week. This plan is intended for trainees with a consistent, industrious, and patient demeanor. You’re not racing against a clock and proper form is critical. The key is building strength with pristine form and masterful technique on every rep. Therefore; you should absolutely rest as long as necessary between sets. The key is accumulating all of the volume in each session. If you suffer from training ADD and can’t bring yourself to rest long enough between sets, you may superset pull-ups with another exercise but your performance mustn’t come at the expense of leaving the gym earlier. The plans are linear from week to week and the reps eventually undulate as you accrue volume. Some of our pull-up training is drawn out much longer but each of the sample plans recommend retesting in the tenth week. Once you retest, take your new max and follow the plan again using your new number. For those strong enough to perform 10 or more reps with bodyweight, you’ll soon add weight with a chin/dip belt, weighted vest, or even chains. Weight increases are usually 2.5 pounds for women and 5 for men (10 for the super-strong). Theresa Ball increased her max reps from 6 to 10. Colleen McNamara went from 3 reps to 8 in only four months while also increasing her bodyweight from 114 to 118. Vanessa “PrettySTRONG” Gale started with 2 reps at a bodyweight of 138 and increased her max to 10 reps.
Sandra Sebastian went from 6 to 9 reps in only 12 weeks. In 2011, Rob Schmidt doubled his max reps from 5 to 10 reps in nine weeks. Elliott White went from 14 reps to 19 reps in 10 weeks while increasing his bodyweight from 193 to 197. People tend to gravitate toward things they excel at while avoiding difficult tasks. The same is true with pull-ups. Heavier lifters avoid them like the plague while other trainees fail to recognize the benefits. The bottom line is that pull-ups help build an impressive physique and can contribute greatly to practically every barbell lift. Success isn’t an accident and training shouldn’t be arbitrary. Oftentimes lifters test strength rather than taking the time to build it. Improving at pull-ups may take some time. Patience, consistency, and hard work are the bedrock of long-term gains. Trust the plan, stay the course, and be gracious for gains both large and small. Remember that progress, no matter how small or incremental, is still progress.